[Sir William Edward Parry, Arctic explorer.] Autograph Letter Signed ('W E Parry.') to unnamed recipient, soliciting a vote in a charity election for a 'poor girl' named Maria Jones. Admiralty [London], 12 August 1828. 1p., 12mo. In fair condition, lightly aged, with small spot of discoloration. He explains that he is 'requested by a particular friend' to solicit the interest of the recipient 'in favor of the poor girl mentioned in the accompanying note, who was an unsuccessful Candidate at the last Election'. He knows that 'the applications in such cases are extremely numerous', but hopes that the recipient 'can give Maria Jones your vote on the ensuing occasion'. [ Sir Robert Phillimore, English judge and politician. ] Autograph Note Signed ('Robert Phillimore') to the Earl of Clarendon, stating his intention of attending 'the sitting of the naturalisation commission'. On letterhead of the Privy Council Office. 'Monday' [ no date ]. [ Admiral Sir Philip Charles Durham, British naval hero. ] Autograph Letter Signed ('P. C. Durham') to a Sea Lord, complaining of his treatment following the capture of Guadeloupe, and seeking preferment for his nephew. [ From Guadeloupe ('this Country') .] 15 August [ 1815 ]. No place. 4pp., 12mo. Bifolium. In fair condition, on lightly aged and worn paper. Docketed on reverse of second leaf: '15 Augt. 1815. | Sir P. C. Durham'. According to the DNB, Durham, having 'cleared the West Indies of American cruisers', 'in June and August 1815 co-operated in the reduction of Martinique and Guadeloupe, at which place the last French flag was struck to Durham, as the first had been'. [ Admiral Vere Beauclerk, 1st Baron Vere. ] Autograph Signature ('Vere.') on part of Exchequer receipt. 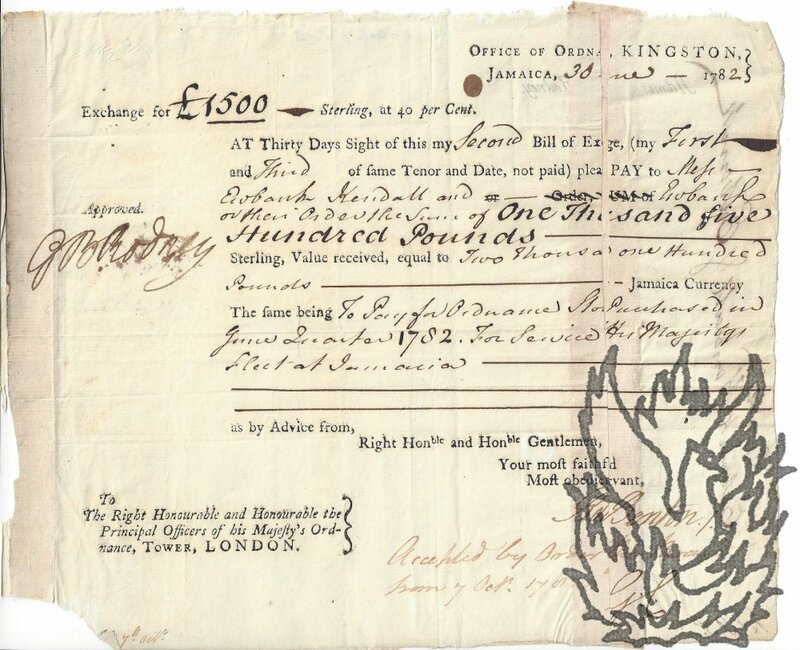 His Majesty's Receipt of Exchequer, London. 27 July 1764. Part of printed receipt made out to Vere, on one side of a trimmed-down 18 x 12.5 cm. piece of paper. In fair condition, lightly aged and worn. Recording the receipt of £42 10s 0d, on behalf of 'Lady Vere & Hble Aubrey Beauclerk'. [ Lord Adolphus FitzClarence, Royal Navy rear admiral and son of King William IV and Mrs. Jordan. ] Autograph Letter Signed ('Adolphus FitzClarence') to an unnamed admiral, declining an invitation to a dinner party. 'St. James's Palace | Monday [ no date ]'. On letterhead of royal crest. 1p., 12mo. In fair condition, on lightly-aged paper with one short closed tear. Reads: 'St. James's Palace | Monday | My dear Admiral | I sincerely regret being engaged for Saturday or I should have had much pleasure in joining your party | Yours Most Truly | Adolphus FitzClarence'. [ Admiral Vere Beauclerk, 1st Baron Vere. ] Autograph Signature ('Vere.') on Exchequer receipt. [ His Majesty's Receipt of Exchequer, London. ] 8 January 1765. 1p., 8vo. In fair condition, aged and with particular wear to extremities. Laid out in the usual way, with printed text completed in manuscript. (The printed name of 'the Right Honourable James Earl Waldegrave, One of the Four Tellers of His Majesty's Receipt of Exchequer' has been amended in manuscript to 'Ld Henley', and the change initaled 'W. C.') Recording payment of £42 16s 0d on an annuity of £85. Signed at end, with the signature of the witness ''. [ Admiral of the Fleet George Byng, 1st Viscount Torrington, as Sir George Byng. ] Autograph Signature ('G. Byng.') on Exchequer receipt, as assignee of George Doddington. [ His Majesty's Receipt of Exchequer, London. ] 19 July 1717. 1p., 8vo. Laid out in the usual way, with printed text completed in manuscript. In fair condition, on aged and worn paper. Records the receipt by 'Sr. 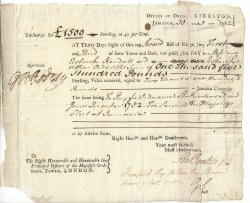 George Byng Assee of Georger Doddington' of £30 10s 0d from an annuity. Witnessed at foot by 'J Nicholson'. [ Jean-Baptiste de Nompère de Champagny, French admiral and politician. ] Autograph Signature ('Champagny') to secretarial document sending condolences to the widow of the former minister Charles-François Delacroix and 'Monsieur & Madame Verninac'. Paris, '17 Brumaire an 14' [ 8 November 1805 ]. 1p., 4to. In good condition, on lightly-aged paper, with the top corners snipped away. Document in a secretarial hand, signed by Champagny, with 'Paris' and 'Le Ministre de l'Intérieur,' printed at the head. Addressed 'à Madame Veuve Delacroix, Monsieur & Madame Verninac' (Delacroix's daughter Henriette married the diplomat Raymond de Verninac Saint-Maur (1762-1822)). Nine-line formal letter of condolence on Delacroix's death, with reference to 'S. M. L'Empereur'. Champagny was elected a member of the Society of the Cincinnati for his exertions in the American War of Independence. [ Admiral William Parry, Arctic explorer. ] Autograph Note Signed ('W E Parry') to 'Mrs. Martineau' ('Caro' = sister? ), explaining why he cannot accept an invitation. 1p., 12mo. In good condition, on lightly-aged paper, with slight loss to one corner. Reads: 'My dear Caro | I cannot go, having an engagement at Greenwich - I will answer for you also. | In haste, | but ever yrs, | W E Parry'. Note: A letter from Parry to "Joseph Martineau, brother-in-law" appears in a Parry archive - perhaps Caro was his sister. One page, 12mo, chipped, closed tear, text complete. A note written in haste (hence some unreadable) to anypone who can help the two men in their travels. "If either of these two men Present themselves to you[,] do me the favor to forward [them] by some craft to their Destination. || Thor Webb, an [Ordn?] for [Lord J.S. Bays?] Ship at Devonp[ort. Direct him to the [?] of Warren, Lieut. Dickson who will see it all right. | William Morris to gain the ordn.